In the below video, you will hear directly from several people with Parkinson’s disease that began taking Restore Gold™. The compounding effect of the seven natural ingredients in Restore Gold™ accomplished what their PD medication could not. Their shared experiences of reversed symptoms and a delay or pausing of Parkinson’s progression are not unique, and are similar to many of the 3rd party verified reviews also available on our website. At three (3) months 87% decided to continue taking Restore Gold™ going forward, while 82% reported positive observations. Out of those who reported experiencing benefits after three months, the average observed benefit is noted at 2.6 months. At twelve (12) months about 79% reported a regression in symptoms that is similar to symptoms 3-5 years ago. At thirty-six (36) months about 74% reported a slowing or pausing of Parkinson’s progression. Conventional medical approaches to treating Parkinson’s disease aim to replace the lost dopamine, but fall short of addressing the ongoing destruction of dopaminergic neurons. As time progresses, the ability of medications to replenish dopamine levels becomes overwhelmed by further loss of dopaminergic cells. Moreover, the pharmaceutical drugs typically used to alleviate symptoms of Parkinson’s disease are heavily loaded with debilitating side effects and often worsen affection over time. Thus, the prognosis for Parkinson’s disease patients relying on conventional treatment remains limited. The mainstream medical establishment has failed to recognize the urgent need to address the multiple, interrelated pathological features of Parkinson’s disease in order to prevent further neuronal loss and slow disease progression. Researchers now know that a primary root cause of Parkinson’s is mitochondrial dysfunction. Secondary causes of Parkinson’s are neural oxidation, neural inflammation, and alpha-synuclein aggregation. A flurry of emergent research has linked mitochondrial dysfunction to the pathogenesis of Parkinson’s disease. Mitochondrial dysfunction results in impaired ATP generation, loss of cellular repair mechanisms, and cellular inefficiency. As mitochondria become dysfunctional they generate large quantities of free radicals, which contribute to oxidative stress that, in turn, causes further mitochondrial dysfunction. Concurrently, loss of mitochondria to oxidative damage means fewer mitochondria are available to meet the energy demands of the cell to repair damaged components. The cascade of mitochondrial dysfunction, oxidative stress, and loss of mitochondria form a continuity that ultimately leads to cell death (Kempster 2010; Lee 2011). Numerous studies have clearly identified mitochondrial dysfunction as a central pathological feature of both genetic and sporadic Parkinson’s disease (Schapira 2008; Zhu 2010). Moreover, many of the genes that confer predisposition to familial Parkinson’s are intimately related to mitochondrial function; much of the neuronal death in Parkinson’s of genetic origin is due to mitochondrial dysfunction, and impaired mitophagy (Lin 2009; Van Humbeeck 2011; Geisler 2010). While several factors, including exposure to environmental toxins (Song 2004; Kraytsberg 2006; Lin 2009), also contribute to mitochondrial dysfunction in the substantia nigra, age-related mutations in mitochondrial DNA are thought to be a primary culprit (Kraytsberg 2006; de Castro 2011). Alarmingly, dopamine itself, and L-DOPA, may contribute to mitochondrial toxicity in dopaminergic neurons (Gautam 2011; Khan 2005; Mosharov 2009). Damaged mitochondria are continually being cleared from within the cell through a process called mitophagy. Mitophagy, a type of autophagy, is a kind of cellular recycling system that clears damaged mitochondria before they can accumulate and cause cellular dysfunction. However, age-related mutations in mitochondrial DNA, which cause mitophagy to become less efficient, coupled with an ever-intensifying propensity for endogenous and environmentally mediated mitochondrial damage cause the neuronal mitophagic system to become overwhelmed (Van Humbeeck 2011; Chu 2011). Over time, damaged mitochondria build up inside the neuron, leading to cell death. Not surprisingly, several of the genetic mutations linked to familial Parkinson’s disease cause disturbances in mitophagy (Van Humbeeck 2011; Geisler 2010). Another toxic byproduct of mitochondrial dysfunction and impaired mitophagy is the formation of Lewy bodies. Lewy bodies form as reactive oxygen species derived from dysfunctional mitochondria damage structural components of the cell called microtubules. As microtubules are damaged, they release a protein called alpha-synuclein. The loose alpha-synuclein proteins then group together, or aggregate, and form a toxic mass (a Lewy body) that further damages the cell. Moreover, alpha-synuclein has been shown to directly interfere with mitochondrial function and inhibit ATP synthesis, furthering the spread of mitochondrial dysfunction in the brains of Parkinson’s disease patients (Li 2007; Liu 2009; Devi 2008). Over time, Lewy bodies spread to neighboring cells, damaging neurons within the vicinity of a dead or dying neuron (Iseki 2000). Lewy bodies share some characteristics with toxic proteins that develop in the brains of patients with Alzheimer’s disease and other neurodegenerative diseases, primarily in that they cannot be broken down and cleared from the cell by normal autophagic (cellular house cleaning) actions. Inflammatory responses contribute to the perpetuation of neurodegeneration in Parkinsons’s disease. The brain contains immune cells called microglia, which are known to be activated in Parkinson’s disease (McGeer 1988; McGeer 2004). Upon activation, microglia release inflammatory cytokines that can spread to nearby healthy neurons and cause degeneration. Dopaminergic neurons in the substantia nigra, the brain region most affected by Parkinson’s disease, express receptors for an inflammatory cytokine called Tumor Necrosis Factor-alpha (TNF-alpha), which suggests that excess TNF-alpha released by nearby activated microglia may damage nigral dopaminergic cells. Elevated cytokines in the brain of those with Parkinson’s disease is a consequence of neurodegeneration (Barcia 2009). In experimental models, exposure to the neurotoxin MPTP (a chemical used to induce Parkisnon’s disease in experiments) leads to death of dopaminergic neurons. Interestingly, in monkeys, inflammation is increased even years after initial exposure to MPTP (McGeer 2004). This suggests that inflammation, once initiated, has long-term consequences in Parkinson’s disease. As dopaminergic cells succumb to either environmentally or genetically induced mitochondrial dysfunction, they release free radicals. These free radicals then activate nearby microglial cells, which in turn, excrete inflammatory cytokines that bind to and damage nearby dopaminergic neurons. This positive feedback loop may continue over years or even decades and slowly contribute to the loss of dopaminergic neurons that leads to Parkinson symptoms (Barcia 2009; Glass 2010). There are no shortage of problems in the substantia nigra for those with Parkinson’s. For decades, Parkinson’s research experts have searched in vain for a magical natural or drug compound to address all issues in the Parkinson’s patient with no practical success. However, in doing so, many compounds have been discovered that have found support for possibly addressing either mitochondrial dysfunction, alpha-synuclein aggregation, neural inflammation, or neural oxidation. 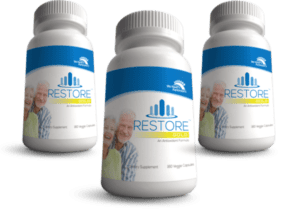 Researchers have known about many of these compounds for years, but for the first time certain compounds have been hand picked to be compounded together in one convenient capsule, called Restore Gold™. Following each ingredient, you can follow the links to the scientific journals that contain Parkinson’s disease related research. Restore Gold™ has rapidly become the go-to for numerous Parkinson’s disease sufferers, seeing positive feedback in more than 80% of cases. While decades of historical Parkinson’s research focuses on simply one natural or drug compound, Restore Gold™ is unique in the fact that seven research supported natural compounds are conveniently brought together. In 2013, a landmark discovery was published in the journal Brain, providing evidence that a compound called UDCA could restore mitochondrial functioning in those with Parkinson’s (Mortiboys 2013). When UDCA is ingested, it is combined with taurine at its first pass of the liver, becoming TUDCA (Tauroursodeoxycholic Acid)(Amaral 2009). As perhaps the most important ingredient in Restore Gold™, TUDCA , with 300mg per serving, has been has been added to Restore Gold™ capsules due to the 2013 research suggesting it can actually restore mitochondrial function and prevent the death of dopamine producing cells. Another one of the key ingredients in Restore Gold™ is n-acetyl-cysteine (NAC), with 400mg per serving. NAC is a natural bottleneck precursor in the cellular production of glutathione, which is often called the “master antioxidant.” A glutathione deficiency in the substantia nigra region of the brain is common in Parkinson’s patients. Having recently demonstrated the ability to increase dopamine binding by 9% and improve UPDRS score results by 13% in preliminary clinical trials, NAC is an important component of Restore Gold™ (Monti 2016). Increased tea consumption is correlated with reduced incidence of dementia, Alzheimer’s and Parkinson’s disease (Mandel 2008). Green tea contains valuable antioxidant polyphenols known to be protective against a host of chronic age related conditions. There is tremendous scientific interest in green tea and its active compound Epigallocatechin gallate (EGCG) as a neuroprotectant in Parkinson’s disease; especially since when compared to many drugs, EGCG is extremely effective at penetrating brain tissue (Levites 2001; Pan 2003). Israeli researchers showed that they could prevent the cellular changes associated with Parkinson’s by pre-treating mice with either green tea extracts or EGCG ahead of inducing the disease by chemical injection (Levites 2001; Levites 2002). This research has subsequently been repeated and extended in laboratories around the world (Choi 2002; Nie 2002; Mandel 2004; Guo 2005; Guo 2007). Utilizing the brain cell cultures pretreated to develop Parkinson’s-like changes, the Israeli group also showed that green tea extracts prevented activation of the inflammation producing NF-kappaB system (Levites 2002). EGCG’s specific anti-inflammatory properties have been demonstrated to protect cultured brain tissue from the loss of dopaminergic cells as well (Li 2004). L-theanine, a component of green and black tea, was shown by Korean scientists to prevent dopaminergic cell death such as that seen in Parkinson’s disease (Cho 2008). Another potential benefit of green tea extract is its ability to inhibit the dopamine degrading enzyme COMT (Chen 2005). This may help to sustain dopamine levels in ailing brain tissue thereby reducing the severity of symptoms. Just as we use multiple combinations of prescription drugs to capitalize on their synergistic effects, we can capitalize on green tea’s neuroprotective effects in Parkinson’s and other neurodegenerative diseases (Mandel 2008). While more human studies are yet to be completed, green tea polyphenols have proven to exert powerful protection for dopaminergic neurons making them a key component in the prevention and treatment of Parkinson’s disease (Guo 2007; Li 2006; Ramassamy 2006; Avramovich-Tirosh 2007; Zhao 2009). In a very recent study, researchers from Arrhus University, Biogen, Amgen, Genentech, Forma Therapeutics, & Alentis Pharma screened almost 750,000 different compounds for their ability to interact with the Parkinsons-associated protein alpha synuclein. Out of 750,000 compounds the researchers found that EGCG robustly blocked the clustering of alpha synuclein. L-tyrosine has been a long-term interest in Parkinson’s research. With fewer side effects than other treatments, L-tyrosine significantly increased CSF tyrosine levels in groups of patients, indicating that L-tyrosine administration can increase dopamine turnover in patients with disorders, such as Parkinson’s (Growdon 1982)(Lemoine 1989). Grape Seed Extract is another ingredient in Restore Gold™. Anthocyanin- and proanthocyanidin-rich botanical extracts, such as Grape Seed Extract, may alleviate neurodegeneration in Parkinson’s via enhancement of mitochondrial function (Strathearn 2014). Collectively, available information supports continued development of Grape Seed Extract for treating a variety of neurodegenerative disorders involving misfolded protein-mediated neuropathologic mechanisms (Ho 2010). Most importantly, Grape Seed Extract contains gallic acid, which is the only known natural compound that may inhibit toxic alpha-synuclein aggregation and make existing fibrils water soluble, enabling the brain’s dedicated immune system to remove the toxic aggregates (Liu 2013). Carnitine is a vital nutrient that serves as a co-factor in fatty acid metabolism. It helps to “ferry” large fat molecules into the mitochondrial “furnaces” where they are burned for energy, making it an important component of brain energy management and mitochondrial function (Virmani 2002). There is a growing body of literature suggesting that carnitine supplementation, through its support of brain energy management, protects against Parkinson’s disease. Mount Sinai researchers were able to prevent chemically induced Parkinson’s disease in monkeys by pre-treating them with acetyl-l-carnitine, a readily absorbed form of the nutrient (Bodis-Wollner 1991). Moreover, Italian researchers have studied carnitine as a neuroprotectant in the brains of methamphetamine users. Methamphetamines cause the same basic mitochondrial destruction and free radical brain damage as that seen in Parkinson’s patients (Virmani 2002; Virmani 2005). This work has been extended in similar studies at the U.S. National Center for Toxicological Research (Wang 2007). In an intriguing study, Chinese nutritional scientists in Shanghai explored in culture both acetyl-l-carnitine and alpha lipoic acid (each alone and in combination with the other) in preventing Parkinson’s disease-like changes in human neural cells. They found that both nutrients either alone or in combination, applied for 4 weeks prior to a Parkinson’s disease-inducing chemical, protected the cells from mitochondrial dysfunction, oxidative damage, and an accumulation of the dangerous alpha-synuclein proteins. Notably, the combination of supplements was effective at 100- to 1000-fold lower concentrations than were required for either acting alone – powerful evidence that led the researchers to state that “this study provides important evidence that combining mitochondrial antioxidant/nutrients at optimal doses might be an effective and safe prevention strategy for Parkinson’s disease” (Zhang 2010). Alpha Lipoic Acid is a potent reducing agent, is considered a universal antioxidant due to its amphipathic nature (both fat- and water-soluble). Alpha lipoic acid is produced naturally within the body and contributes to xenobiotic detoxification and antioxidant protection. It also contributes to cellular energy production (Ghibu 2009). In addition to its ability to directly neutralize toxins and free radicals, alpha lipoic acid bolsters levels of other cellular protectants such as glutathione and vitamin E (De Araujo 2011). The low molecular weight of alpha lipoic acid allows it to easily cross the blood-brain barrier, delivering neuroprotection within the central nervous system. Alpha lipoic acid also combats inflammatory reactions (De Araujo 2011). Don’t give up. Do something more. Avramovich-Tirosh Y, Reznichenko L, Mit T, et al. Neurorescue activity, APP regulation and amyloid-beta peptide reduction by novel multi-functional brain permeable iron- chelating- antioxidants, M-30 and green tea polyphenol, EGCG. Curr Alzheimer Res. Sep 2007;4(4):403-411. Barcia C et al. Inflammatory response in Parkinsonism. J Neural Transm Suppl. 2009;(73):245-52. Bodis-Wollner I, Chung E, Ghilardi MF, et al. Acetyl-levo-carnitine protects against MPTP-induced parkinsonism in primates. J Neural Transm Park Dis Dement Sect. 1991;3(1):63-72. Chen D, Wang CY, Lambert JD, Ai N, Welsh WJ, Yang CS. Inhibition of human liver catechol-O-methyltransferase by tea catechins and their metabolites: structure-activity relationship and molecular-modeling studies. Biochem Pharmacol. May 15 2005;69(10):1523-1531. Cho HS, Kim S, Lee SY, Park JA, Kim SJ, Chun HS. Protective effect of the green tea component, L-theanine on environmental toxins-induced neuronal cell death. Neurotoxicology. Jul 2008;29(4):656-662. Choi JY, Park CS, Kim DJ, et al. Prevention of nitric oxide-mediated 1-methyl-4-phenyl-1,2,3,6-tetrahydropyridine-induced Parkinson’s disease in mice by tea phenolic epigallocatechin 3-gallate. Neurotoxicology. Sep 2002;23(3):367-374. De Araujo DP et al. The contributions of antioxidant activity of lipoic acid in reducing neurogenerative progression of Parkinson’s disease: a review. Int J Neurosci. 2011 Feb;121(2):51-7. Epub 2010 Dec 2.
de Castro IP et al. Mitochondrial quality control and Parkinson’s disease: a pathway unfolds. Mol Neurobiol. 2011 Apr;43(2):80-6. Epub 2010 Dec 1. Devi L et al. Mitochondrial import and accumulation of alpha-synuclein impair complex I in human dopaminergic neuronal cultures and Parkinson disease brain. J Biol Chem. 2008 Apr 4;283(14):9089-100. Epub 2008 Feb 1. Gautam AH and Zeevalk GD. Characterization of reduced and oxidized dopamine and 3,4-dihydrophenylacetic acid, on brain mitochondrial electron transport chain activities. Biochim Biophys Acta. 2011 Jul;1807(7):819-28. Epub 2011 Apr 2. Ghibu E et al. Antioxidant properties of an endogenous thiol: Alpha-lipoic acid, useful in the prevention of cardiovascular diseases. J Cardiovasc Pharmacol. 2009 Nov;54(5):391-8. Glass CK et al. Mechanisms underlying inflammation in neurodegeneration. Cell. 2010 Mar 19;140(6):918-34. Growdon JH et al. Effects of oral L-tyrosine administration on CSF tyrosine and homovanillic acid levels in patients with Parkinson’s disease. 1982; 8;30(10):827-32. Guo S, Yan J, Yang T, Yang X, Bezard E, Zhao B. Protective effects of green tea polyphenols in the 6-OHDA rat model of Parkinson’s disease through inhibition of ROS-NO pathway. Biol Psychiatry. Dec 15 2007;62(12):1353-1362. Ho L, Pasinetti GM. Polyphenolic compounds for treating neurodegenerative disorders involving protein misfolding. 2010; 7(4):579-89. Iseki E et al. Degeneration process of Lewy bodies in the brains of patients with dementia with Lewy bodies using alpha-synuclein-immunohistochemistry. Neurosci Lett. 2000 May 26;286(1):69-73. Kempster PA et al. Relationships between age and late progression of Parkinson’s disease: a clinico-pathological study. Brain. 2010 Jun;133(Pt 6):1755-62. Epub 2010 Apr 5. Khan FH et al. Inhibition of rat brain mitochondrial electron transport chain activity by dopamine oxidation products during extended in vitro incubation: implications for Parkinson’s disease. Biochim Biophys Acta. 2005 Jun 30;1741(1-2):65-74. Epub 2005 Apr 14. Kraytsberg Y et al. Mitochondrial DNA deletions are abundant and cause functional impairment in aged human substantia nigra neurons. Nat Genet. 2006 May;38(5):518-20. Epub 2006 Apr 9. Lee MS et al. The effect of age on motor deficits and cerebral glucose metabolism of Parkinson’s disease. Acta Neurol Scand. 2011 Sep;124(3):196-201. doi: 10.1111/j.1600-0404.2010.01446.x. Epub 2010 Sep 29. Lemoine P et al. L-Tyrosine: a long term treatment of Parkinson’s disease. C R Acad Sci III. 1989; 309(2):43-7. Levites Y, Amit T, Youdim MB, Mandel S. Involvement of protein kinase C activation and cell survival/ cell cycle genes in green tea polyphenol (-)-epigallocatechin 3-gallate neuroprotective action. J Biol Chem. Aug 23 2002;277(34):30574-30580. Levites Y, Weinreb O, Maor G, Youdim MB, Mandel S. Green tea polyphenol (-)-epigallocatechin-3-gallate prevents N-methyl-4-phenyl-1,2,3,6-tetrahydropyridine-induced dopaminergic neurodegeneration. J Neurochem. Sep 2001;78(5):1073-1082. Li R et al. (-)-Epigallocatechin gallate inhibits lipopolysaccharide-induced microglial activation and protects against inflammation-mediated dopaminergic neuronal injury. J Neurosci Res. 2004 Dec 1;78(5):723-31. Li R, Peng N, Du F, Li XP, Le WD. Epigallocatechin gallate protects dopaminergic neurons against 1-methyl-4- phenyl-1,2,3,6-tetrahydropyridine-induced neurotoxicity by inhibiting microglial cell activation. Nan Fang Yi Ke Da Xue Xue Bao. Apr 2006;26(4):376-380. Li WW et al. Localization of alpha-synuclein to mitochondria within midbrain of mice. Neuroreport. 2007 Oct 8;18(15):1543-6. Lin TK et al. Mitochondrial dysfunction and biogenesis in the pathogenesis of Parkinson’s disease. Chang Gung Med J. 2009 Nov-Dec;32(6):589-99. Liu G et al. alpha-Synuclein is differentially expressed in mitochondria from different rat brain regions and dose-dependently down-regulates complex I activity. Neurosci Lett. 2009 May 1;454(3):187-92. Epub 2009 Feb 28. Mandel S, Maor G, Youdim MB. Iron and alpha-synuclein in the substantia nigra of MPTP-treated mice: effect of neuroprotective drugs R-apomorphine and green tea polyphenol (-)-epigallocatechin-3-gallate. J Mol Neurosci. 2004;24(3):401-416. Mandel SA, Amit T, Kalfon L, Reznichenko L, Youdim MB. Targeting multiple neurodegenerative diseases etiologies with multimodal-acting green tea catechins. J Nutr. Aug 2008;138(8):1578S-1583S. McGeer PL et al. Inflammation and neurodegeneration in Parkinson’s disease. Parkinsonism Relat Disord. 2004 May;10 Suppl 1:S3-7. McGeer PL et al. Reactive microglia are positive for HLA-DR in the substantia nigra of Parkinson’s and Alzheimer’s disease brains. Neurology. 1988 Aug;38(8):1285-91. Monti D et al. N-Acetyl Cysteine May Support Dopamine Neurons in Parkinson’s Disease: Preliminary Clinical and Cell Line Data. 2016; 11(6):e0157602. Mosharov EV. Interplay between cytosolic dopamine, calcium, and alpha-synuclein causes selective death of substantia nigra neurons. Neuron. 2009 Apr 30;62(2):218-29. Nie G, Cao Y, Zhao B. Protective effects of green tea polyphenols and their major component, (-)-epigallocatechin-3-gallate (EGCG), on 6-hydroxydopamine-induced apoptosis in PC12 cells. Redox Rep. 2002;7(3):171-177. Pan T, Jankovic J, Le W. Potential therapeutic properties of green tea polyphenols in Parkinson’s disease. Drugs Aging. 2003;20(10):711-721. Ramassamy C. Emerging role of polyphenolic compounds in the treatment of neurodegenerative diseases: a review of their intracellular targets. Eur J Pharmacol. Sep 1 2006;545(1):51-64. Schapira AH. Mitochondria in the aetiology and pathogenesis of Parkinson’s disease. Lancet Neurol. 2008 Jan;7(1):97-109. Song DD et al. Enhanced substantia nigra mitochondrial pathology in human alpha-synuclein transgenic mice after treatment with MPTP. Exp Neurol. 2004 Apr;186(2):158-72. Stratheam et al. Neuroprotective effects of anthocyanin- and proanthocyanidin-rich extracts in cellular models of Parkinson’s disease. 2014; 25;1555:60-77. Van Humbeeck et al. Parkin interacts with ambra1 to induce mitophagy. J Neurosci. 2011 Jul 13;31(28):10249-61. Virmani A, Gaetani F, Imam S, Binienda Z, Ali S. The protective role of L-carnitine against neurotoxicity evoked by drug of abuse, methamphetamine, could be related to mitochondrial dysfunction. Ann N Y Acad Sci. Jun 2002;965:225-232. Virmani A, Gaetani F, Binienda Z. Effects of metabolic modifiers such as carnitines, coenzyme Q10, and PUFAs against different forms of neurotoxic insults: metabolic inhibitors, MPTP, and methamphetamine. Ann N Y Acad Sci. Aug 2005;1053:183-191. Wang C, Sadovova N, Ali HK, et al. L-carnitine protects neurons from 1-methyl-4-phenylpyridinium-induced neuronal apoptosis in rat forebrain culture. Neuroscience. Jan 5 2007;144(1):46-55. Zhang H, Jia H, Liu J, et al. Combined R-alpha-lipoic acid and acetyl-L-carnitine exerts efficient preventative effects in a cellular model of Parkinson’s disease. J Cell Mol Med. 2010 Jan;14(1-2):215-25. Zhao B. Natural antioxidants protect neurons in Alzheimer’s disease and Parkinson’s disease. Neurochem Res. Apr 2009;34(4):630-638. Zhu J et al. Mitochondrial dysfunction in Parkinson’s disease. J Alzheimers Dis. 2010;20 Suppl 2:S325-34.